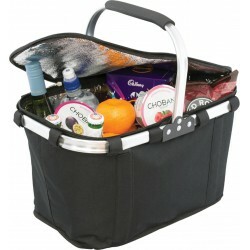 Promotional picnic sets make a great branded gift for clients or staff. An easy way to get customers to notice you in any outdoor setting is with branded picnic sets. 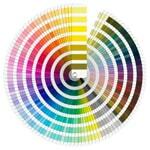 They are considered to be among our more popular outdoor promo products as they exude practicality and uniqueness. 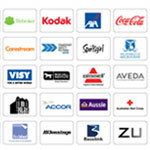 Branded with your corporate logo or name, these promotional items are certainly eye-catching. You will be delighted with the collection of custom picnic sets offered by ACE. 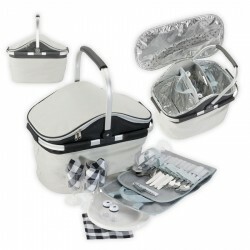 For starters, we have printed picnic carry baskets which lend an authentic touch to any picnic. 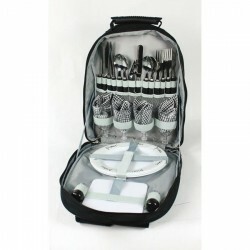 We also have a budget 4-person picnic set which comes in a handy backpack. Functional features of our merchandise include insulated cooler compartments, sturdy 600D polyester material and compact design. For further information, simply click on the images below. 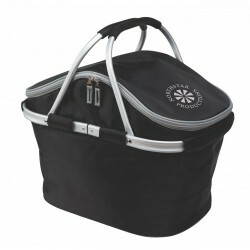 Picnic bag with insulated cooler compartment, carry handles and shoulder strap. Two tone 1200D polyester and 600D black polyester with 6mm PE foam insulation. 300D ripstop, separate shoe compartments with mesh ventilation, including neutral shoe shine, soft cloth and brush with integrated shoe horn. 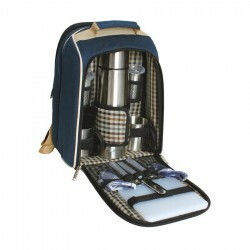 Stylish picnic backpack with 600D nylon, rubber handle, front storage and four sets of cutlery, plates, glasses and napkins. Compact fully insulated 600D nylon backpack with beige checkered interior design complete with branding badge. 750ml stainless steel vacuum flask, two stainless steel coffee mugs, cheese board, spoons, milk/sugar containers and serviettes. Complete with branding badge. Sturdy aluminium frame with rubberised handles. Completely collapsible for easy storage. Features: Made from mesh and 600D polyester. Manufactured from 600D woven polyester, this bag has an insulated main compartment and front pocket containing 2 x plastic wine glasses, waiter's friend, cheeseboard and napkins. Black Jacquard material, 4 person setting, Large cooler compartment, Adjustable shoulder strap, Gloss gun-metal Morrissey zip pulls and fittings. 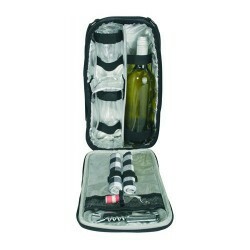 2 compartment wine cooler bag, 600D polypropylene, Includes 2 acrylic glasses, waiters tool, 2 serviettes. 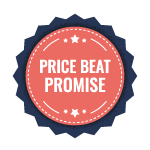 Economically priced, offers great value. Comprises large capacity rear cooler compartment, 4 piece setting in front compartment, with clear plates, glasses, knives, forks, spoons and cotton serviettes. In navy blue 600D polypropylene with white trim. 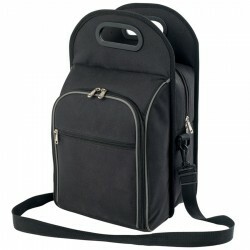 Black 600D with grey 2-tone trim, this bag incorporates a zippered flap opening with black PVC patch. With wine waiters tool and front outside pocket. In polybag. Large capacity 600D cooler backpack. Front compartment featuring a four piece picnic set including spoons, serviettes, cheese board, cheese knife, waiters tool and salt and pepper shakers. Containin carrier compartment, and coloured trimming. In polybag. Collapsible aluminium framed picnic basket in 600D polyester with contrasting 420D polyester trim. and rubber grip on handle. Supplied in polybag. 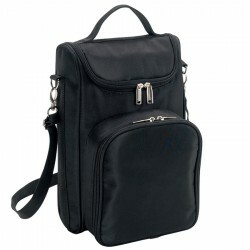 Carry case style with additional shoulder strap, featuring a large capacity cooler section. Front c setting including dinner plates, acrylic glasses, knives, forks, spoons, serviettes, cheeseboard, c shakers. In polybag. 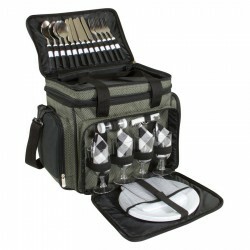 BBQ Picnic Bag features a zippered compartment that includes a 3 piece BBQ set including a fork, to knife, salt and pepper shakers, knife and fork, waiters tool and towel. Main compartment is a large shoulder strap. In polybag. 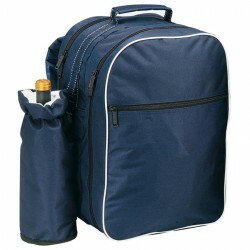 Foil insulated cooler bag, 38cm carry handle, 4 person setting. 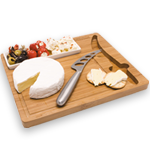 Features large capacity cooler compartment, silver foil lined, 4 piece picnic setting including dinner plates, acrylic glasses, knives, forks, spoons, serviettes, cheese board, cheese knife, waiters tool and salt and pepper shakers. In 600D sand cooler. Microfibre, 2 person set includes: 2 acrylic wine, glasses, napkins, waiter’s friend, cheese board and knife, Holds 2 wine bottles, U-shaped double zippered insulated bottle compartment, Piping around sides and front pocket, Baseboard and central divider in bottle compartment, Single zippered front pocket. 600D polyester with PVC backing. Large insulated cooler compartment. Insulated side bottle holder. Front zippered compartment. 4 piece picnic set. Front zippered pocket. 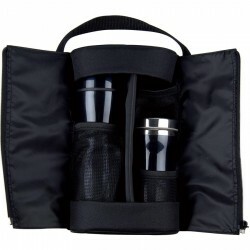 600D polyester, Fully insulated with aluminium PVC lining, Includes - 2 acrylic goblets, 2 cotton napkins, waiter's friend bottle opener & bottle stopper, Shoulder strap & carry handle, Can be adjusted to carry 2 bottles, Metal badge, Wine not included.